But as he grew bigger, his needs became too much for the amateur zookeepers, and a nature reserve advised them that Mansur was too accustomed to people to be able to adapt to living in the wild - he had even befriended the pet husky dog of one of the pilots. Once settled in Oreshkovo, Mansur the Air Bear became a hit with the public both in person and online - even making it into the British press - but three years later his upkeep is becoming more than a matter of space and devotion. The aerodrome told Komsomolskaya Pravda that Mansur's "monthly expenses" - when he isn't hibernating - run to about 30,000 roubles (£350; $452) for food, staff costs, and maintenance of the enclosure. 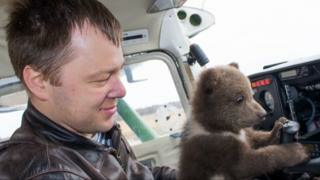 But pilot Andrei Ivanov says they hope to use the bear's Instagram following to generate income for his upkeep, namely through live-streaming his activities for all to enjoy - and perhaps pay for the privilege. Andrei is Mansur's guardian, and takes his responsibilities very seriously - as he explained to several bemused potential brides when he took part in Russian TV's hit show "Let's Get Married!" in December. Viewers can contribute money via Mansur's page on the popular DonationAlerts service, whose Yelena Inozharskaya told Komsomolskaya Pravda this was a first for the company. "Usually our clients blog about playing computer games, cooking, drawing, dancing or travelling. It's hard to find anything that hasn't been streamed yet, but we're ready to help a bear earn some money," she said. The public can see how close they are to meeting each specific target on a live tracker - the first objective being to build the young bear a pool that he can bathe in as spring approaches. This could be welcome choice. As Andrei Ivanov says, "Our Air Bear hasn't hibernated all winter".